Andrey Kostin blacklisted: What happens with VTB’s bid for Essar Steel? Home /Insights/Andrey Kostin blacklisted: What happens with VTB’s bid for Essar Steel? On 6 April 2018, the US Government imposed new sanctions against Russian businessmen and government officials. One of them, Andrey Kostin, reacted furiously. Kostin is the head of already sanctioned VTB Group and his designation jeopardizes one of VTB’s most important projects: the bid for Essar Steel India. “Any further U.S. sanctions would be “economic war’”, VTB Group CEO Andrey Kostin said in January 2018. And, apparently, the “economic war” started on 6 April 2018, when the U.S. Department of the Treasury’s Office of Foreign Assets Control (OFAC) unleashed its most significant Russia sanctions action in years, adding 24 Russian oligarchs and senior officials to the Specially Designated Nationals and Blocked Persons (SDN) list. The action freezes the US assets of the blacklisted individuals; their US dollar transactions are liable to be blocked or frozen. All their international bank accounts are frozen and they are subject to the visa bans. U.S. persons are prohibited from dealing with them. For Andrey Kostin, the US sanctions come at the worst time possible. The 61-year old is the president and chairman of state-owned VTB Group, which includes VTB Bank (Russia’s second-largest lender) and its subsidiaries. VTB Group has been subject of US and EU sanctions since 2014 after Russia’s annexation of Crimea from Ukraine. But the designation of Kostin poses particular compliance challenges for companies dealing with VTB. In the press release announcing Kostin’s designation, the US Department of Treasury specifically mentioned that “non-U.S. persons could face sanctions for knowingly facilitating significant transactions for or on behalf of the individuals or entities blocked today”. And both VTB and Kostin are currently involved in a ”significant transaction” with a non-US entity. VTB Capital, the investment division of VTB Group, is leading a consortium to bid for Essar Steel, a major Indian flat carbon steel manufacturer, part of the Mumbai-based Essar Group, which is controlled by the Ruia family. The potential deal is estimated to be worth at least US$6 billion. That explains why Andrey Kostin is so concerned about sanctions pressure on VTB. It also explains his furious reaction to the US Government decision. Hours after OFAC announcement, Kostin was on CNN condemning the US sanctions and the “American administration high level of misunderstanding of the Russian leadership’s intentions”. “We should stop somewhere, Kostin said, for the sake of our children”. Andrey Kostin has very strong ties with Ruia family. VTB CEO has frequently met with Shashi and Ravi Ruia, founders and promoters of the Essar Group. 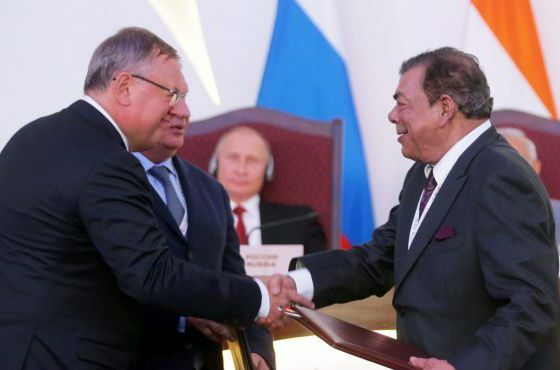 Andrey Kostin and Shashi Ruia after signing an agreement in the presence of Russian President Vladimir Putin and Indian Prime Minister Narendra Modi on 11 December 2014 in New Delhi. The Ruia family, once one of the richest families in the world, is currently plagued with debts. Essar Steel has been placed under bankruptcy proceedings for defaulting loans in December 2015. Forced by lenders to sell and restructure to pay off hefty loans, the Ruias turned to Kostin for help. The Ruias have been VTB Bank’s clients for years. Andrey Kostin was behind VTB Capital’s decision to focus on Asian market after imposition of sanctions by the West. VTB’s bid for Essar Steel, through a Mauritius-based investment vehicle called Numetal, in which VTB Capital is the largest shareholder, is part of this new strategy. US Government hit Andrey Kostin hard. The U.S. sanctions have big implications in India.